A village which owes its name to an old Norman castle, the earthwork ruins of which can be seen across the stream from the parish church. The church boasts a comical sundial with the punning inscription, 'Bee in Thyme'. Within the church is the village maypole, which was stored in the church and used as a ladder to reach the belfry! Before the Norman invasion of 1066, the manor here was owned by Morcar, King Harold's brother-in-law. Castle Bytham parish includes Morkery Wood, named for Morcar. The first record of the name Bytham comes from 1067. The name itself comes from the Old English word for a broad valley, or valley bottom The Domesday Book of 1086 recorded the village as West Bytham. The castle part of the name came later in the 11th century after the Domesday Book was written. William the Conqueror granted the manor at Bytham to his half-brother Odo, Bishop of Bayeux, and it was probably Odo who erected the motte, or castle mound. In 1221 the castle was held by the 3rd Earl of Abermarle against Henry III. The king, aided by William de Warenne, 5th Earl of Surrey, besieged and destroyed the castle in 1224. It was burnt again during the Wars of the Roses 2 centuries later, and by the 16th century, it was described as ruinous. The castle motte can easily be seen behind the church. 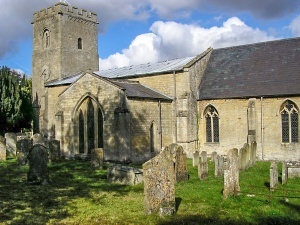 St James' church dates to the Norman period, around 1200. Unusually, the main entrance is on the north side rather than the traditional south. This is odd because in the Middle Ages the north door was considered the 'devil's door', and most churches blocked any north doorways to prevent the devil gaining entrance to the church. There are pieces of Saxon stonework suggesting that there was an earlier church on this site long before the Norman building was erected. The 17th-century maypole is thought to be one of the oldest in England. It bears a carved inscription saying in rather archaic language, 'This Ware the Maypoul 1660'. It is thought to have been made to celebrate the Restoration of Charles II to the throne, and the repealing of laws during the Commonwealth which banned traditional Mayday celebrations. It was converted into a ladder shortly after the Restoration of the Monarchy. 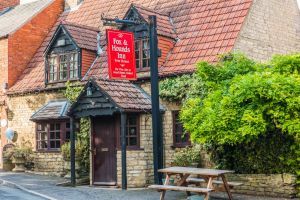 There are 2 pubs, the Fox & Hounds on High Street, and the Castle Inn, a traditional country pub, built around 1650 of local limestone. The interior is an atmospheric mix of old oak beams and period furnishings, with the walls hung with antique prints, tapestries, heritage memorabilia from the village's past, and some of the original deeds to the pub. The Castle was known for much of its life as The Three Tuns, but when an earlier Castle Inn was destroyed by fire in 1976 the inn was renamed in honour of the Norman castle motte. Castle Bytham has been named a conservation village so that the traditional historic architecture and ambience can be preserved. Many of the houses date from the 15th-18th century. Among these is The Priory, built in the 15th century but sporting an Elizabethan facade. The village holds an annual Midsummer Fair to raise money for local causes.